Here’s this week’s Media Mix, which is about the fires in Kawasaki in May that killed 10 people living in a kanishuku hakujo. Though I mentioned it only in passing, the day lodgings in Sanya tend to be made of concrete, which means they’re safer than the wooden ones that burned in Kawasaki. I don’t know if this has to do with stricter enforcement of fire codes in Tokyo, but it should be noted that kanishuku hokujo in Sanya are now patronized by more than just day laborers. As I pointed out, some now house incapacitated seniors, many of whom used to be day laborers but are unable to work any more. I saw a documentary on NHK last year that described how some of these lodgings are used as hospices: men on welfare who are in the terminal stages of illness being supported by NPOs who try to make them as comfortable as possible in their last days. But another demographic that uses these lodgings is foreign tourists, specifically backpackers. When I lived in the area and Minami Senju was the closest train station to my home I often encountered young travelers from Europe and Asia who would ask me for directions to this or that facility, and all were in the kanishuku hokujo style, meaning small rooms with communal toilets and baths. Some had even upgraded and started serving breakfast just to attract more foreign tourists. The appeal was multifold. 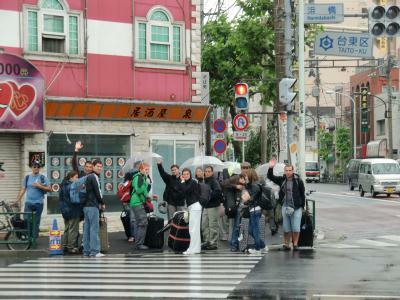 Mainly, the places were really cheap, so backpackers could stay in Tokyo for a long time and use it as a base. But they also liked the rough demeanor of the accommodations and the neighborhood, which to them represented Japan in a more genuine way. The Japanese media have reported on this phenomenon in depth and at length, since it shows an appeal for foreigners that most Japanese people would not expect. Few of the reports I’ve seen, however, mention the core clientele of these lodgings, the day laborers, and maybe they’re being priced out. I moved out of the area in 2011 and haven’t been back since. This entry was posted in Media and tagged day laborers, foreign tourists, Sanya. Bookmark the permalink.